Helsinki, Kunstmuseet Ateneum, 1961, no. 30. Paris, Musée Galliera, Survage, Exposition rétrospective, 1966, no. 77 (illustrated). Lyon, Musée des Beaux-Arts, Survage, October-November 1968, no. 41. New York, Greer Gallery, Survage, April-May 1970, no. 18 (illustrated in color; with incorrect dimensions). Eric Brosset has confirmed the authenticity of this work. Born in Moscow towards the end of the nineteenth century, Survage was expected at a young age to pursue a career in his family business making musical instruments, specifically the piano. Survage's grandfather had founded a piano factory there after emigrating from Finland and his father would eventually assume a managing position. Despite demonstrating an early talent as a pianist, Survage preferred to pursue painting and enrolled in the Moscow School of Painting, Sculpture and Architecture at the age of 22. He has explained of his decision, "I am but an interpreter when playing the piano, but with painting, I am a creator" (quoted in exh. cat., op. cit., 1970). Survage met and befriended the sculptor Alexander Archipenko at the Moscow Art School. This early relationship would prove fruitful after the artist moved to Paris in 1908. Archipenko, who had been a frequent visitor to Paris prior to moving there full time in 1909, did his best to introduce Survage into the artistic circles and salons that had begun to take hold of the culture. Survage became a regular at the salons held at the home of the writer Helen d'Otteingen where painters, sculptors and writers of the avant-garde were welcomed, among them Georges Braque, Constantine Brancusi, Max Jacob and Pablo Picasso. He participated in his first show at the Salon des Indépendants in 1911, in the Cubist Gallery. Despite this early connection with the group, he preferred to remain detached from them. As Paul Fierens wrote in 1931, "Cézanne to the right, cubism to the left, Survage passed between the two, opening his own road" (quoted in ibid.). 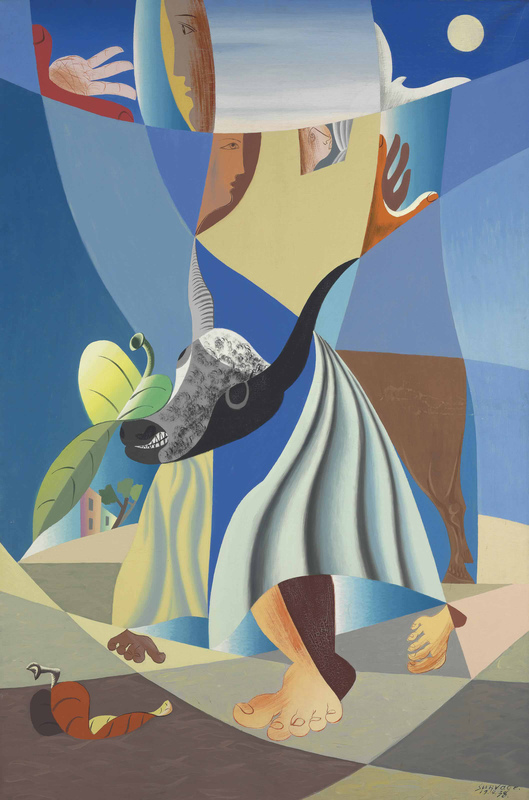 The bull had been used as a metaphor for many of Survage's contemporaries: Picasso and André Masson among them. Customarily seen as bold and destructive, Survage's bull is not immediately identifiable as violent. Emerging from a white muleta instead of the traditional red, the only hint of aggression pent up in the beast is reflected in its bared teeth. In the background we see the hands of the toreador in an open palmed gesture, as a white dove flies off in the distance. This traditionally symbolic sign of peace brings an additional sense of calm to the work.